Bachelorette Wine Tour with Austin Party Shuttle On Friday August 1st 2014, a fun-loving group of Austinites booked their party. 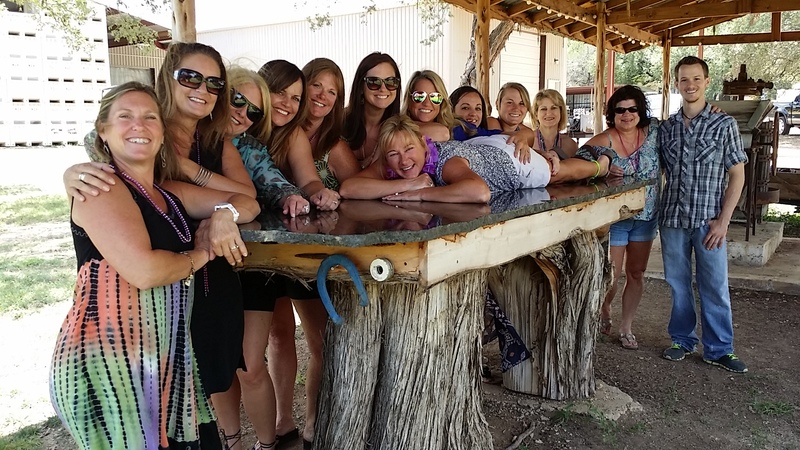 It was a Bachelorette Wine Tour with Austin Party Shuttle. The ladies were trying to make it to 4 wineries but they only make 3 venues. The wineries were all in the Fredericksburg Wine Road 290 association of 13 Texas wineries along US Highway 290 corridor near Fredericksburg, Texas. All were having laughing and seemed to be having a fantastic time in an out of the Party Bus. Our 1st winery was Williams Chris Vineyards. a winery that can accommodate groups of all sizes. A great venue to gather for the latest prize wining samplings. Their Buildings are a blend of new and old with lots of antiques. Browsing makes one wonder about how the past wine craftsmen labored for their aged vintages. The friends 2nd stop was Four points Cellars just a couple of miles down the road on hwy 290. This winery began as a collaboration between 3 Texas wineries. They are composed of Brennan Vineyards, Lost Oak Winery, and McPherson Cellars. The vineyards are in Comanche, Burleson, and Lubbock, Texas. They have tasting rooms, out doors patios and occasionally have a band for live music. This frivolity with help stretch the ole vino palette. The last winery stop of the day was to Pedernales Cellars. It’s located just off of 290 at 2916 Upper Albert Road. This winery venue offers superb distant views from it oak tree-shaded patio. The ride home was is usually the groups funnest part of the trip and this one was no exception. They were rocking out!